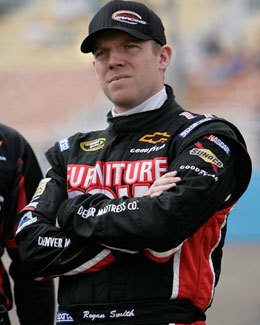 Regan Smith is originally from the Syracuse, N.Y. area where he grew up an unabashed hockey fanatic. Regan drives the No. 78 Furniture Row Chevrolet in the NASCAR Sprint Cup Series. Since moving to North Carolina for his racing commitments, Regan has grown to become a passionate Carolina Hurricanes fan. When he isn’t racing, Regan can often be seen at the RBC Center cheering on the Canes. Follow Regan on Twitter and Facebook. Think of all the similarities between hockey and racing. The two sports are fast paced, the hits (or impacts with the wall) are hard, both are performed on an oval-shaped structure in front of great fans, and, well, that’s about where the similarities end. Before I start rambling on too much let me introduce myself. 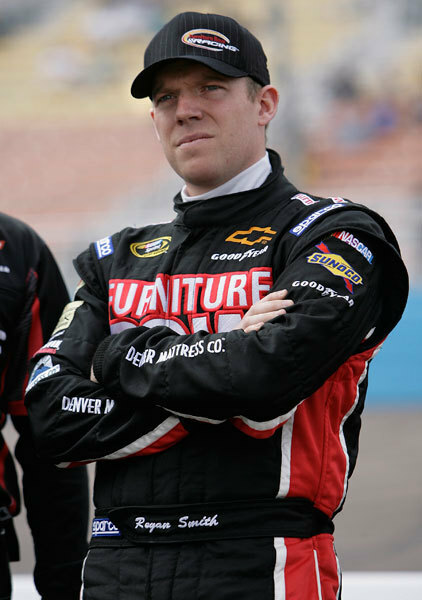 My name is Regan Smith and I drive the No. 78 Furniture Row Chevrolet in the NASCAR Sprint Cup Series. I will admit that I have absolutely zero experience playing hockey and, to be honest, the few times I’ve had skates on it probably resembled a cat trying to be shoved into a bucket of water rather than a person skating. With that being said I am a huge fan of the sport and my beloved Carolina Hurricanes. Having grown up in the Syracuse area I have definitely seen my fair share of snow and ice and I guess when you spend eight months of the year in winter-like conditions you have to learn to enjoy winter sports. When my family and I moved to the Charlotte area in 1995, I quickly realized that watching hockey was going to be much more difficult. Fortunately for me, and so many other transplants from the north, I only had to wait two years until it was readily available again. While I was never a Sabres or Rangers fan, both were regularly on TV, and after stomaching four straight Super Bowl losses as a Buffalo Bills fan, I had to swear off all Buffalo sports. As far as the Rangers go, I have never really been much of a fan of New York City sports teams as a whole, so that pretty much sums up how a Syracuse kid becomes a fan of a southern hockey team. When the opportunity came to share my opinions and write the occasional blog for the Canes, I was super pumped. I have to thank the organization and everybody involved with it for letting this happen. I’m not much of a writer, but hockey brings out the opinions in me. I did hit the wall pretty hard on the day that I said I wanted to type it out, so that may have played a part in my decision to do this. I’m going to be writing these blogs strictly from a fan’s view as that is where my knowledge of hockey ends. If I say something that is inaccurate, don’t hesitate to let me know. Now on to business. While I know that the season didn’t end the way that any of us wanted it to, there is so much to be excited about as a Canes fan. For me personally when the season started I felt if the team could get to mid-season in contention for a playoff spot, which they did, then it would be smooth sailing from there. With the simple fact that the Canes were among the youngest NHL teams for most of the season, it only seemed logical that things would progressively get better, and they did. It seemed like the mix of veterans and young players were just about perfect. When the Canes were clicking they looked awesome at times. I didn’t miss very many games this year, but the one that I was forced to miss due to my racing schedule was the season-ending game against Tampa Bay. For me personally it was the capper to a pretty terrible weekend, as we crashed racing in Texas while the game was going on. As disappointing as it may seem, the reality of the situation is that the team was already playing playoff-style hockey for the previous 10 games, and sometimes it just doesn’t work out. Along with all the young players that we all know about who are currently on the big team, you also have to look at what’s going on in Charlotte with the Checkers. As I’m writing this, I am fresh off of watching them play Game 5 vs. the Hershey Bears, in which the Checkers earned a come-from-behind win. I’ve been to about six of their games this year and personally think that what’s going on in Charlotte is yet another great sign for things to come. That team has been strong all year, and has a bunch of young talent, some of which have shown already that they will be in Raleigh soon. The draft is up next and based on the success the team had last year with their picks (the Jeff Skinner pick in particular), I’m excited to see how it turns out and am hoping that we haven’t been spoiled. Skinner is my pick to win the Calder, and if he doesn’t then we should all go throw eggs at the doors of all the voters (maybe that’s not a great idea, but it felt good to type it). I’ll check back in before the draft, but in the meantime here’s one more thought to leave you with: had the Canes made it, and the playoff beard-growing began, would Skinner had been able to even grow one? It was possibly some kind of divine intervention to give him one more year to make sure he didn’t have to get harassed for the next two months. (I’m just messing with you, Jeff). Until next time, Go Canes!